Where does everyone find their icons of Fr. Seraphim Rose?I've been looking for one but can't find one. Uncut Mountain Supply has several. A pity two of them show him with a halo - he hasn't been proclaimed a saint yet. And the third one has his worldly surname Rose in the inscription, instead of the proper appellation of Platina. I don't know if I could have an icon of the divine ascent in my prayer corner. The sight of souls being dragged to damnation by dark demons would surely distract me from prayer. FINALLY I found someone who feels the same way I do about that icon. I can't stand looking at it - it's very disheartening to me. Definitely not one I will ever have in my home. I would view a soul being dragged to damnation as motivation to be a more humble person in all aspects of life, not something that is disheartening and distracting. I don't know, I just feel very sad for the damned souls while looking at that icon. I don't have an icons of the Last Judgment for the same reason. It's just my own personal quirk. Back on topic here are some pictures of my "corner" which is actually a dresser. One day I'll have them in a proper corner but I'm a little cramped for space right now. The Ladder of Divine Ascent is a didactic image, i.e. intended primarily to teach a moral lesson, rather than primarily for veneration as a conventional icon. IIRC, it first appeared as a manuscript illumination in a document of monastic or patristic literature, and was later reproduced as a stand-alone panel or mural. To not wish to have it in one's icon corner is no biggie. Though, OTOH, it does reflect the old monastic adage exhorting humility of keep your mind in hell, and despair not. Mine is very modest and small, but it is growing. Every time I make some money, I put a little bit aside for Icons. Right now I have a large Resurrection Icon as well as a small St. George Icon, I have two Theotokos Icons coming in the mail right now. I'll post pictures once I get them. Beautiful The icons are lovely and I like the personal touches like the glass flowers and the embroidered Orthodox cloth. Can I ask where you purchased your icons and the cloth from? Hi Deborah, the cloth is vintage and was from eBay. The seller is named "mytsarina" and she usually has a bunch of them for sale. If there's a particular icon you're wondering about, PM me because they were bought from all different places! Beautiful, very beautiful. Do you mind if I ask where you got those icons? This line might need to be explained to me. Hell seems like the last place anyone would want to have their mind. Think of the torments of hell to avoid temptation and sin, I believe. The large one of the Mother of God on the left is the famous Vladimirskaya (Virgin of Vladimir), originally painted in 1132 in Constantinople for a Russian patron. 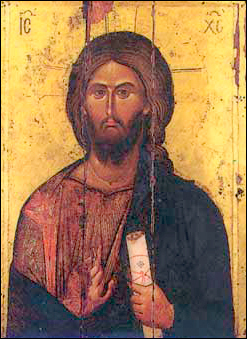 The large icon of Christ is the central panel of a triptych (the other panels being of the Mother of God and St John the Baptist in supplication to Christ) from the Dionysiou Monastery at Mt Athos. Painted in the mid-15th century, this series is one of the very finest examples of the Cretan School of iconography, and a personal favorite. The small icon to the upper right of the shelf (one of four surrounding the shelf) is of Great-martyr Catherine, from the later Cretan School period, and modeled on Venetian paintings of the saint. All three of these are well-known, and should be readily available at many icon sellers. 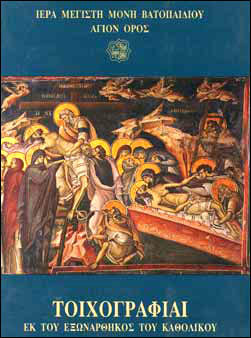 The two lower ones in the group of four are St Onouphrius the Great, and the Seven Sleepers of Ephesus. The other icons (other than the San Damiano crucifix) are not distinct enough for me to identify them. I'll be off to Mt. Athos in a few days. I hope they sell some icons there to add to my icon corner. They do. Cheaper than in shops, as well. Blessed journey. I dream of going there..but it would be a brutal experience for a new orthodox as I am, at this stage. Thank you! I just ordered one(with halo) but it bothered me less than the one that uses Rose, maybe that's just me. be sure to update us! may God guide u on your journey. by the way, nearly all my icons (in my icon area) are paper ones. it works well for moving house a lot! i hope that doesn't look bad. which are scattered (if a number as small as 3 can be 'scattered'!) through the house. i think i'll leave at that until i am not the only orthodox person in the house (my excuse for not having smart icon corner worthy of photo). 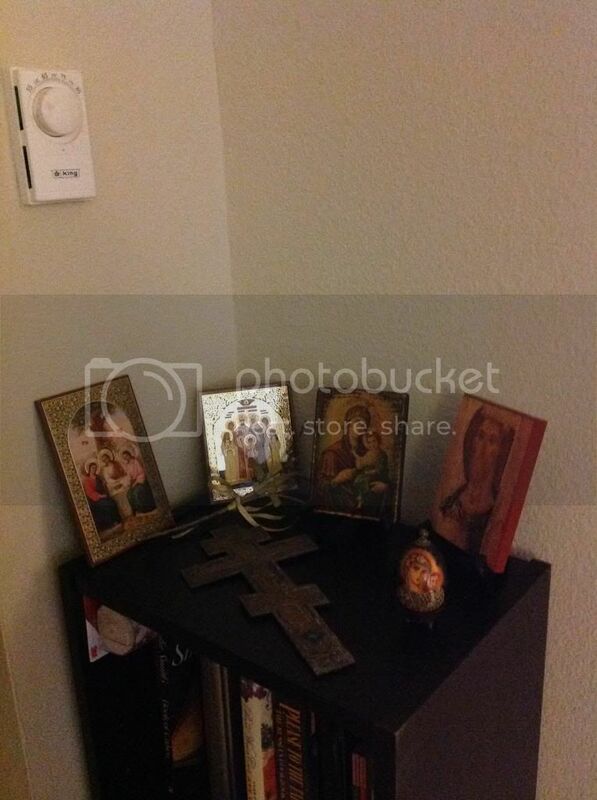 I have a prayer corner with a mirror and small icons. 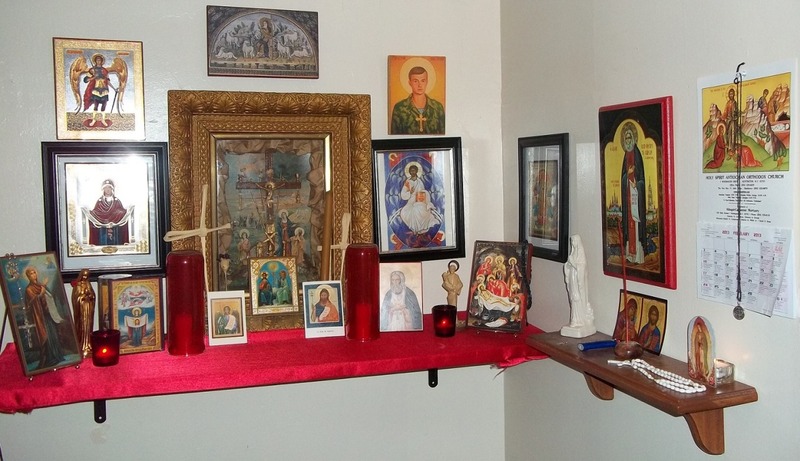 It is not excactly a prayer corner I have as there are no room for it here, but a prayerplace with icons yes. Unfortunately due to some people and their comments about icons, I do not feel like sharing pictures. Wish not to be accused of heresy and "icon love" again. Just a piece of advice: you probably won't afford very many expensive handmade icons, so if you go to Vatopaidi, Iviron or other such monasteries, you can buy very good reproductions of some of their frescoes and other icons. These are high quality, large and affordable - at Vatopaidi they come in folders which cost less then 5 Euro (there's one with the frescos of Panselinos and one with the "mobile" icons IIRC). Once you are back you can "mount" them on planks of wood or frame them. This way you should be able to save a lot of money and luggage room. I have it in mine. For some reason, it has always been one of my favorite icons. Will soon have that icon too, as a lesson and reminder. 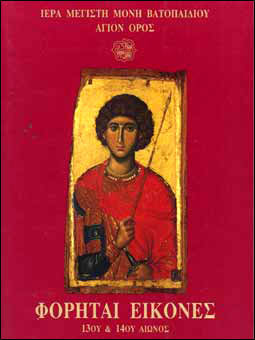 I went through a period of buying every icon that caught my eye, thinking I'd learn the saint's story at a later time. I didn't know the names of the figures in 1/3 of my icon corner! I've since down-sized, and use the icons that don't really have significant meaning to me as gifts. I only have my "patron saints" - saints my nun friend says chose me. I ask their special prayers when I pray. What kind of shops do you have?! From what I've heard from others Athos is the worst place to buy anything since their prices are unimaginable. Depends. I would imagine it's better to buy directly from the source, without having shipping and retailer profit raise the prices further. I have two hand-painted icons from Athos (with authenticity certificates); a triptych and a hanging one. I got them in a souvenir shop in Monastiraki, not a 'serious' church supplier, back in 2007 for nearly €100. What would you expect to pay today? Only if you buy from the monastery shops or from the tourist shops in Ouranopouli (for those over excited people who buy things before they even get on the boat). If you go to one of the shops in Daphne, icons are pretty cheap...certainly much cheaper than you could get them in the US or Western Europe, or on one of the main English-languge websites. That's where I got my icons from as well. It's a small world. That's some great advice. I think I'll buy them in Daphne. Probably from the same shop, in Areos Street. I know the area very well. It's been one of my favourite places to shop since I was a teenager. I had to expand it thanks to the not-so-small icon of St. Seraphim of Sarov that I received for Christmas. Nephi, what's the book sitting with the spine facing out in the centre front of your icon corner? Thanks! 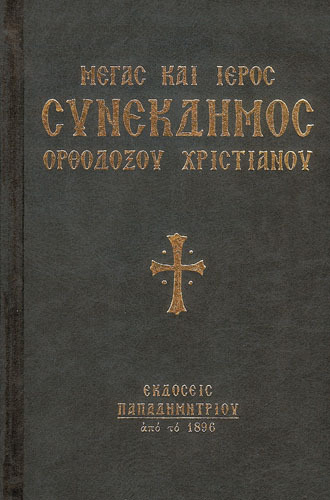 It's the St. Philip's Prayer Manual, which can be found here. I have a cross like that in my icon corner, although I suspect mine is smaller than yours: that looks like a weapon! It's huge (in the range of 10-12 inches) and metal with blue enamel....and nothing specific to hang it from, so until I come up with some cunning plan....it was amongst the 'stash of Orthodoxy' from my uncle. I do suspect that it could double as an intruder deflection instrument, yes! That comment brought this to mind. I rather like that version of the Old Testament Trinity.